Heyyaaa (ﾉ≧∀≦)ﾉ. Anyone know about this Color Lens?? I just got this lens from my lovely sponsor Tomatoonshop for review purpose. This brand named Baby Color and this is the Summer Doll series, you can check official Baby Color website HERE!!. This lens is come in super cute packaging, the most cute contact lens packaging I've ever seen! Here's how it looks on my eyes. So Pretty and fun. I think it kinda look like fireworks in the middle of the night. I wear it about 4-6 hours and it still feel good on my eyes. It's not as thin as Barbie eye though but still really comfortable. But if I compared this to I.Fairy, I think I.Fairy is more comfortable than this, just a little bit! 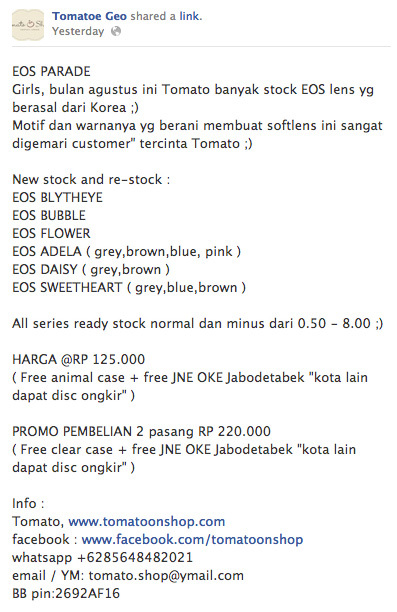 Check out their on going promotion on EOS lens. sono renzu ga kawaii dechuuuuuuuu~~~~~~~ xDDD wait what 19.8 mm I'm not sure I can get that into my eyes xD suka tapi warnanya baguuussss :3 semakin galau mau beli softlens, kebanyakan pilihan! LoL! aku jg penasaran bgt sm lens ini tp ga brani coba krn diameternya yg 19.8mm o.O trnyata wrna brownny ckup natural yaa..
Well, thanks for sharing the review! Oh never heard of it, but the design is so pretty! I don't see many like that actually. I love how it looks on you *A* so pretty~ Although I've never heard or seen this brand before! i've never heard of this brand but they look really nice on you!